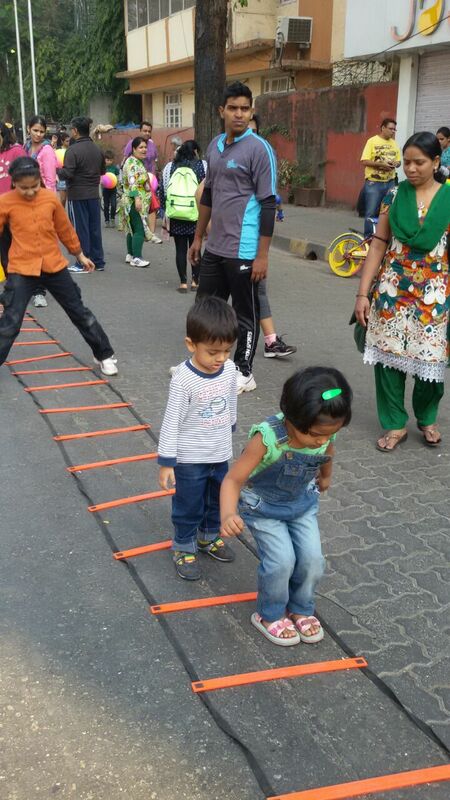 The Equal Streets at Khar-Bandra was launched sometime in October. 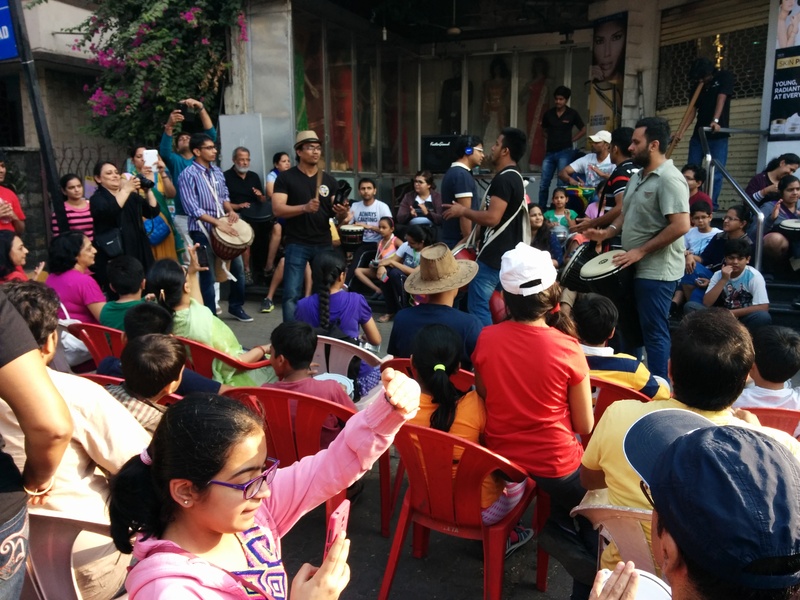 Every Saturday, we would decide to wake up early and hit the Equal Streets at Bandra the next morning. But somehow, it didn’t materialize. Or should I say, our sleep and laziness won over our enthusiasm. But last Sunday, I decided to go, come what might. For those who don’t know what Equal Streets Movement is, it is an initiative by The Times of India Group to avail of traffic-free streets for Mumbai citizens. So every Sunday, from 7 to 11 in the morning, one side of the street on Khar-Bandra Linking Road and parallel S. V Road are non-accessible to vehicles. My friend and I took our kids and hit the Equal Streets at 8:30 am. The activities were in full swing. Kids were cycling, rollerskating, skateboarding, running and jumping on the road without a care about the notorious Mumbai traffic. Then there was street graffiti. Kids and adults alike were drawing on the street with colorful chalks. My daughter and my friend’s son sat down too on the dirty ‘ew’ street and doodled. She looked up happily at me and said, “Mama, see I drew Peppa Pig.” On closer inspection, it did resemble the chubby animated character. As we looked at the activity sheet, we realized that all the happening activities were on the other end of the street which was a good 2-3 kms away. With kids in tow, it felt like a death sentence. So we caught a rickshaw from the other side (the other side of the road is accessible to vehicles) and went to National College. 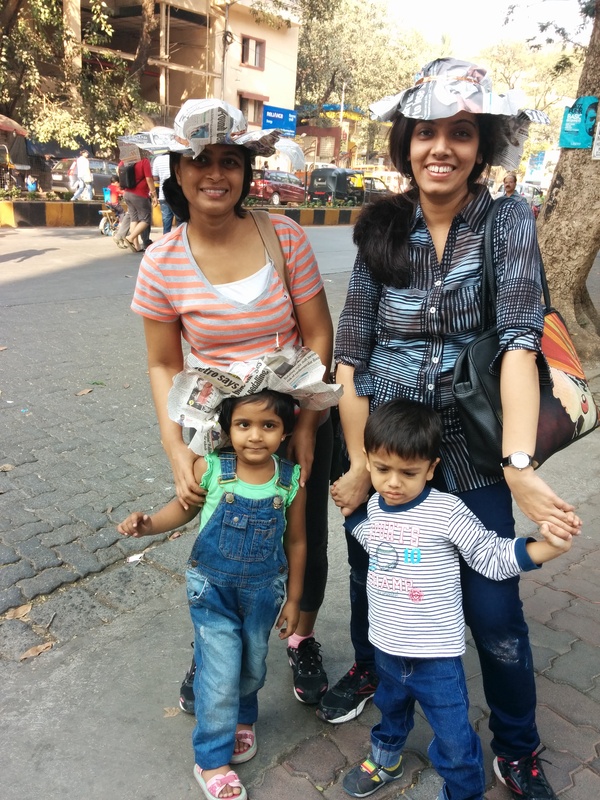 There at a kiosk, we got ourselves these pretty paper hats made. We look adorable with our silly hats, don’t we? By the way, that’s my daughter’s classmate. He was sulking (he had to give back the chalk that he borrowed and that upset him) and didn’t want to be clicked. Further ahead, there was a live drumming session in the middle of the road. It was fun! There were group Yoga and Pranayama classes too. We decided to give them a miss. Next time, maybe. We saw college going students playing hopscotch, dog and the bone, badminton…oh it was so nostalgic! It reminded me of those good old days when I was young and played these games with the kids in the neighborhood. There were some fitness activities promoted by a nearby gym. Our kids enjoyed that too! Equal streets on a Sunday morning was like a fair. At every 50 meters, we saw something new. It’s a treat for us as well as the kids. It was something that we could do again and again and not get tired of it. We plan to go again very soon, and this time I am taking the bicycles. By the way, there is a bicycle booth where you can rent bicycles on an hourly basis. Though the activities largely remain unchanged, they update the activity chart every Saturday for the next day. This event will take place every Sunday till 31st May. It will discontinue briefly during the rains and then resume in October. Also, one more piece of advice – Try to reach as early as possible. Mostly, activity booths start closing by 10-10:30 as it becomes hot, the crowds start thinning and material for origami, clay molding, craft activities, etc., start depleting. It was a great way to spend my Sunday doing things I would normally never think of doing on a street. As for the kids, they had a super duper time. But my Sunday was not over yet. 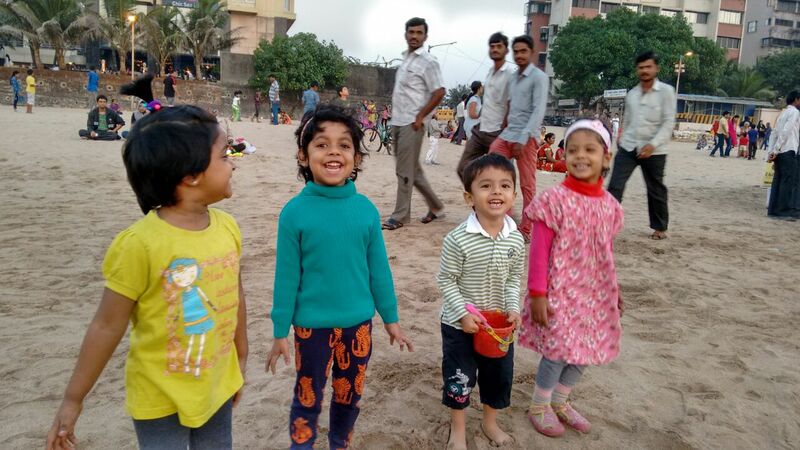 In the evening, my friends and I took the kids to Juhu Beach, where they played in the sand (while we yapped), watched large kites flying in the sky and saw the beautiful orange sun setting into the sea. What a day! I loved it. And so did my daughter.